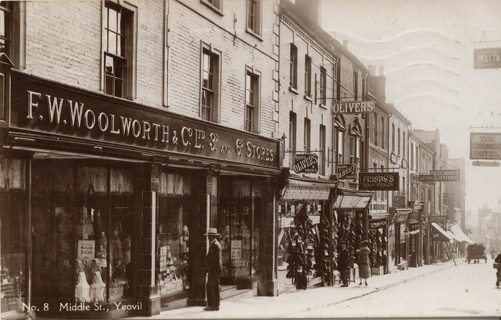 Woolworths opened on Middle Street in Yeovil, opposite the George Inn, in November 1925. 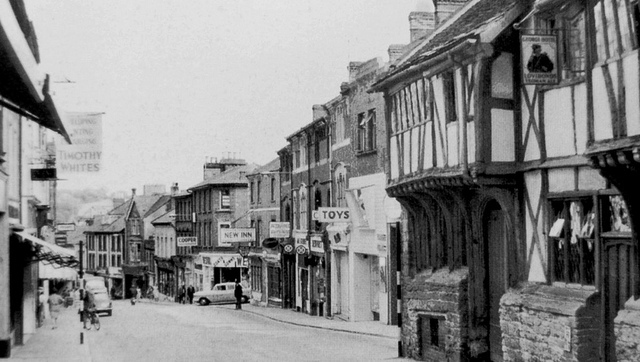 Middle Street was the main road from London to the West Country then, so it was a very busy area. 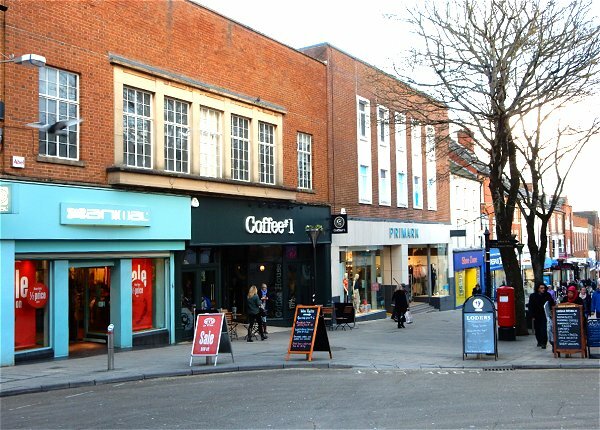 The store was extended in 1931, and then it looks as though it had a 1950s makeover from the look of the frontage in the below photo. 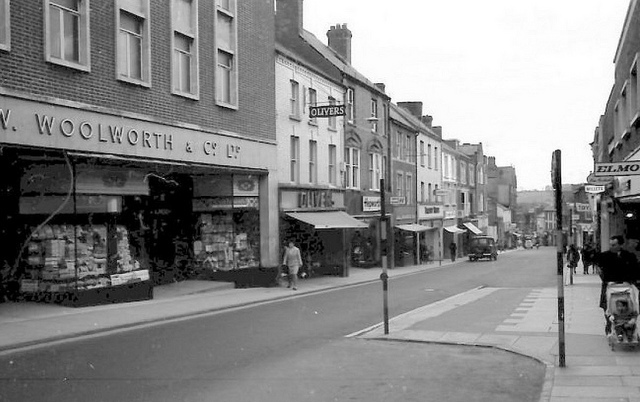 Here’s an extract from ‘Yeovil in the 1960s‘, with Middle Street described by Roger Froude who was a teenager then, “of course FW Woolworth’s – still stuck in the 1950s with its wooden floorboards and the aroma of hot fresh roasted peanuts.” – so funny how Woolworths was never up-to-date! 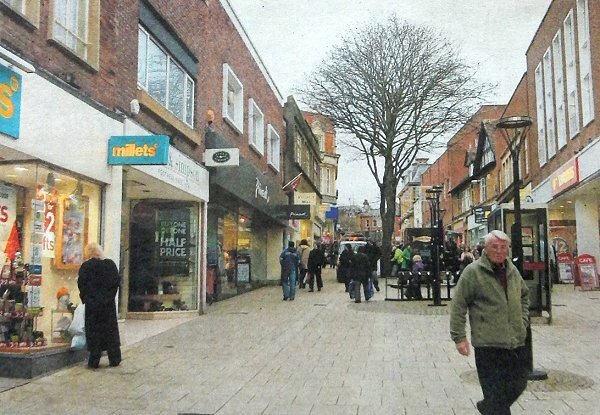 “I think we all mourn the passing of Woolies – but the interesting thing about this photo is the ‘footprint’ of the George Inn on the pavement. Here is a photo of the George, shame it was demolished. The 60s really was a decade of architectural crimes! This is where the 99p store stood recently – I guess it’s now Poundland. It was Primark for many years, but you’ll see where they moved to if you read on. Back to Woolworths, and the store was modernised in 1973. 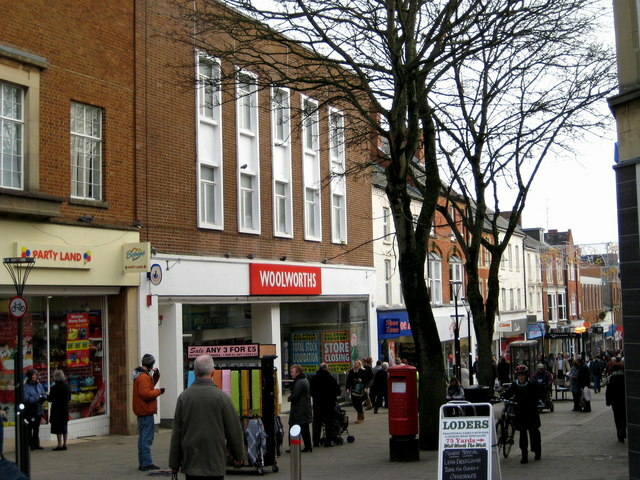 Then in 1985, it was chosen to be one of the first prototype Woolworths Weekend comparison stores, including a Tea Bar restaurant. Penny White was the assistant manager at that time. She says it was the first to get the red walkway and the lighting was really expensive! They had a lovely team of people who made being away from home much nicer. Moving on two decades and in the 2000s, it became one of the 10/10 trial stores. You can see it on the right of this 2007 photo, it looks as though there was a really strange red and yellow fascia. Opposite the Woolworths, you can see Primark on the left of the photo, on the site of the old George Inn – it too having a strange logo. This photo was taken shortly before the store closed for good in December 2008. The building lay empty for over 18 months, when it was announced that Primark would be moving from across the road to open a bigger contemporary store. The new Primark opened in 2011, with the 99p Store occupying the old Primark building opposite. It is still quite recognisable as a Woolies building.